A Rain of Frogs > Kaboom! 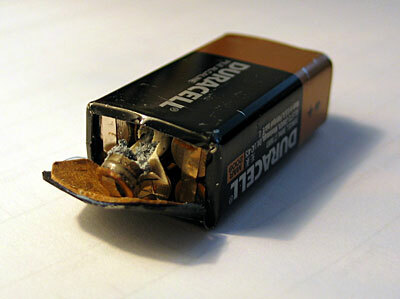 9-volt batteries have an inherent design flaw. You see, its possible for the terminals (which are both on the same end of the battery) of a battery casually tossed into a musicians cable case to touch something metal. And I was always taught that was a no-no. I hear it’s the work of terrorists. Oh, probably! Or El NiÃ±o. it’s ELVES i tell ya! or has he left the building?